Here in Chiang Mai you can find the most friendliest Horst Bar in town Adam’s Apple Club Chiang Mai. Cute, handsome, friendly Asian Boys welcome you in this chic and modern Host Bar. Adam’s Apple Club is one of Thailand’s oldest Host Go-Go Bars and the best known Host Bar in Chiang Mai, in the North of Thailand. The club is located on Viangbua Road in Chiang Mai’s Chang Puek district to the north of the city center. Keep smiling and enjoy YOUR gay life. Have fun in the No. 1 Host Club in Chiang Mai, with the hottest Asian Boys and the best Cabaret Shows. 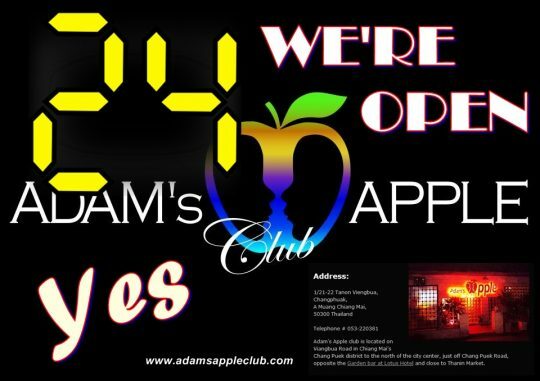 We are looking forward to welcoming you to our Host Bar Adam’s Apple Club in Chiang Mai.